The second season of The Muppet Show premiered in September 1977 to a receptive audience. The show’s first season had garnered tremendous praise and Muppet love was in the air. The feel-good story of the popular puppets’ success on television and the genius behind them was a welcome addition to any news or talk show. The Tonight Show featured them during the late night time slot, and Mike Douglas and Merv Griffin had them on in the afternoon. For morning viewers, Good Morning America put substantial resources into a three-part series highlighting the creativity behind the scenes which aired over three days in November, finishing on the 25th, Thanksgiving morning. ABC’s correspondent David Hartman took advantage of Jim’s being in New York as Jim and his team prepped for the second half of The Muppet Show, Season Two. They would be heading back to London during October, but in the meantime, the workshop was busy building or dressing characters. For the first segment, Jim welcomed Hartman to the workshop on 67th Street. Hartman enjoyed being there, saying, “It’s exciting to be here. I have been smiling ever since I walked in the door, and that’s your fault; I thank you for it.” Jim spoke a bit about how he got into puppetry and television. 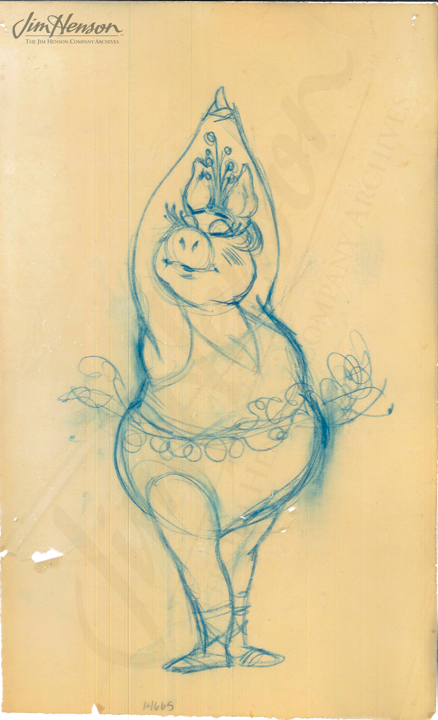 He introduced Hartman to Dave Goelz who was working on some Whatnots and to Mari Kaestle who was making the oversized pig costume for the “Swine Lake” bit scheduled for Rudolph Nureyev’s episode. She and Jim explained the process from design to costume. The second day’s segments included a demonstration from Faz Fazakas of how Muppet eye mechanisms work and a more in depth discussion of the horse being created for the Bob Hope episode. For that, Jim was joined by Frank Oz, Michael Frith, and Caroly Wilcox who was actually building the horse (from Jim and Michael’s designs.) Jim explained that the horse and Hope would be shot using Chroma-key and further explained the blue-screen process. Oz discussed how many puppeteers would be needed (probably four – front feet, back feet, head and tail.) 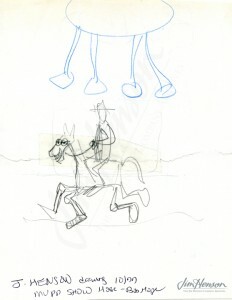 They looked at Frith’s sketches, and Wilcox discussed materials, showing a horse that she had built for Sesame Street as an example and estimating that the new horse would take a full month to build. They finished with banter about who would perform the horse, and Jim suggested that the personality of the horse should match the puppeteer’s. Oz asked, “Whose personality is like a horse?” and Jim replied cagily, “I’m not saying, Frank.” As it turned out, it was Jerry Nelson. Read more about Bob Hope and the Muppets. Rudolph Nureyev and a large pig dance “Swine Lake” on The Muppet Show, 1977. Micheal Frith’s concept for “Swine Lake,” 1977. 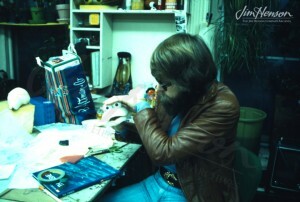 Dave Goelz working in the Henson workshop in 1977. 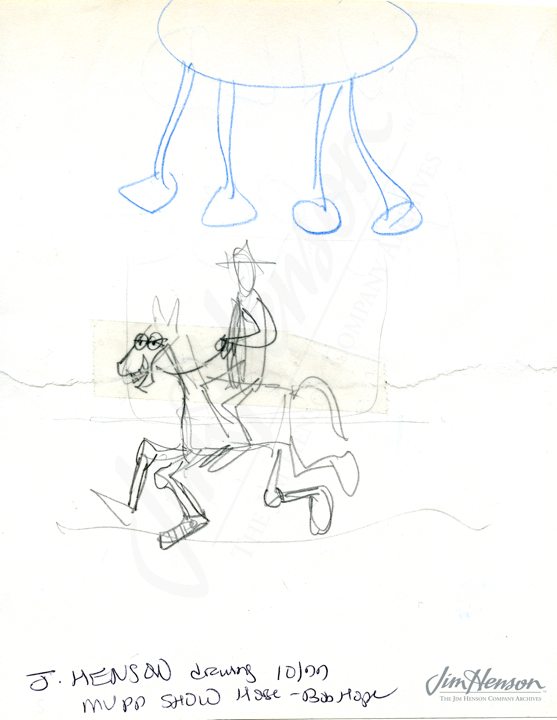 Jim’s rough sketch for Bob hope’s horse, 1977. This entry was posted in 09-September '77 and tagged Dave Goelz, David Hartman, Good Morning America, Mari Kaestle, Rudolph Nureyev, Swine Lake. Bookmark the permalink.